Due to my alliances regarding a conflict older than any past or present members of Menudo, the adventures of Marvel’s (dead) Thunder God have long escaped my notice. Considering this, The Ballad of Beta Ray Bill seemed like a good starting place, because it focuses not on ol’ goldilocks, but one of Marvel’s most well-received spin-offs: the guy with, arguably, the ugliest face in comics as well as (I think so anyway) the coolest freakin’ name. Not to mention the fact that it features the first storyline from Thorite-favorite, Walt Simonson. Tapped by Nick Fury, Thor travels through space to meet a potentially dangerous spaceship heading for Earth. Once on the ship, a powerful alien (Beta Ray Bill) believes Thor is one of a race of demons attempting to annihilate his people. Bill manages to separate Thor from his legendary hammer and K.O.’s the thunder god after he transforms into the all-too-human Donald Blake. To everyone’s surprise, including Bill’s, he manages to use Thor’s hammer and the power that comes with it. After Odin takes him to Asgard, mistaking him for Thor, Bill’s troubles are revealed. He is searching for shelter from a horde of space demons who pursue his people. He believes he now has the power necessary with Mjolnir in his possession, but for obvious reasons Thor isn't willing to hand it over without a fight. While you expect Thor to play second fiddle to Beta Ray Bill - considering both the subtitle of the trade as well as Thor’s absence on the cover - what’s genuinely surprising is that he doesn’t play second fiddle. More like fourth or fifth fiddle. 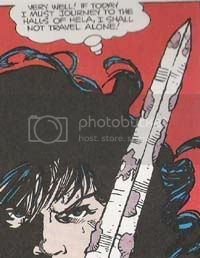 He’s the focus of the first issue - when Bill is first introduced as an antagonist - but after that the tragically heroic Bill, the heartbroken Sif, a disillusioned Balder, and Big-Thor-Daddy Odin loom larger in the story than the guy whose name adorns the cover (Dear Bruce Jones: Take notes). It’s difficult for me to say this is a “welcome change” since I’m so unfamiliar with Thor, though it was a pleasant surprise. While the two certainly have different storytelling voices, I was struck by how Simonson’s intimate understanding of mythology and fable reminded me of Neil Gaiman’s Sandman. Particularly when Marvel’s-Favorite-Fatty Volstagg settles his weight atop an overzealous warrior and recounts the tale of Balder’s stay in Hel and its ramifications, in spite of the obvious content restraints, you can easily imagine you’re reading one of the many strange tavern tales of Sandman: World’s End. And despite the S.H.I.E.L.D. Agents; the space battles; the space borne protagonist; and even the slightly disarming feeling that springs up when you watch the gods assembled at the forging of Stormbreaker - Beta Ray Bill’s answer to Thor’s Mjolnir - all sporting protective goggles, every bit of the story feels like a tale you could find in Aesop’s Fables or Greco-Roman myth. Despite the relative limbo he’s suffered since Simonson’s departure from Thor, The Ballad of Beta Ray Bill survives as one of the most tangibly mythic and epic superhero origin tales, and I was glad that - despite my previously mentioned allegiance - I enjoyed every page. There’s little I can think of to put in the minus column, though if there is anything it’s the conclusion of the trade. Simonson spends so much time introducing us to Bill and winning us to his side that the concluding battle seems tacked on. Still, the rest of the story makes up for it. There is one little thing that’s minor enough to forget, but too nagging to not mention. When Fury first tells Thor of Bill’s spaceship, he mentions the ship devours an entire star in order to power itself, thereby destroying the star's accompanying system. 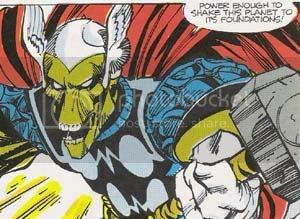 Considering the heroism Simonson lends Beta Ray Bill, it seems likely the accompanying system was meant to be uninhabited, but it’s never mentioned. Like I said, not a huge deal, yet considering how much this will remind the avid Marvel comics reader of a certain tall purple guy with an insatiable appetite, some clarification would’ve been nice. 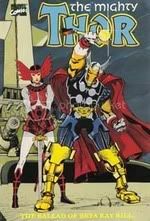 Ultimately, Thor: The Ballad of Beta Ray Bill will be returning to my swap list, but not for any failings of the story. Upon searching for a follow-up trade, I learned that none exists. Rather, these four issues and the eight following it are collected in Thor Visionaries, Volume 1: Walt Simonson, and so I’m hoping to replace it with something a bit thicker.